Registration is free of charge. You can register here on our webpage or via mobile app arriva bike. After the registration you can use all shared bicycle schemes in the world operated by nextbike! Bicycle rental is available via mobile app or directly via bike computer..
TO ACTIVATE YOUR ACCOUNT YOU NEED TO PROVIDE PAYMENT CARD DETAILS. For each additional login in to your arriva bike customer account, you will use this PIN. HOW DOES THE SMART PHONE REGISTRATION LOOK LIKE? Rental is possible through the mobile App or smart card (issued by ARRIVA Nitra, nextbike). You can rent up to 4 bikes at a same time. To rent a bike you need to enter bike number into the App or scan smart card issued by ARRIVA Nitra, on the boardcomputer. To unlock the bike you will receive code by SMS. 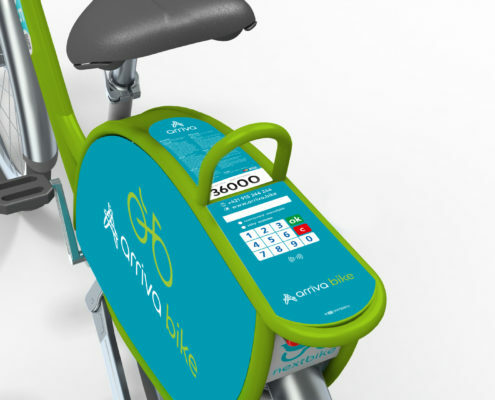 You need to be registered customer of arriva bike system. Enter your phone number and 6 - digits PIN code on the bike computer. Or scan your smart card (issued by ARRIVA Nitra or nextbike) on the bike computer and enter 6 - digits code on the bike computer. The bike lock opens automatically. Bicycles can only be returned at official bike stations in Nitra. In order to return the bike lock the bike at one of the 7 stations and confirm return via bike computer. Return the bike at an official bike station. Insert the bike into a dock and insert the cable lock into the fork and through the dock to secure the bike. If there is no free dock at the station, please lock the bike with its integrated cable lock on the front fork right next to the station. Lock the bike with its cable lock through the fork and the dock. Press "OK" on the bike computer to confirm return and follow instruction.